This article is over 4 months old. You might like to search for more up-to-date information. More than 33,000 social action projects - from food banks to debt counselling - are run or supported by churches, according to figures setting out for the first time the full scale of the Church of England's service to communities. The figures on the extent of social action by Church of England churches were collected as part of the annual Statistics for Mission 2017 survey. The findings - which amount to the largest survey to date of the extent of the Church of England's work with some of the most vulnerable in society - show that 80 per cent of congregations are involved in one or more forms of social action. "From food banks to debt counselling and lunch clubs to language classes, these figures spell out for the first time the sheer scale and range of our churches' commitment to their communities. "We are doing more to love and help people in need than at any time since 1945. "We don't just do this to be 'nice' but because our faith in Jesus Christ compels us to act." Data gathered from 13,000 churches shows that the biggest area of work is in food banks - with 60 per cent, or nearly 8,000 churches - involved in either running or supporting food banks through volunteers, donations and providing venues. Nearly a third, or 32 per cent, of Church of England churches run or support parent and toddler groups; just over a quarter, or 26 per cent, lunch clubs; and just over one in five, or 22 per cent, community cafes. Holiday clubs and breakfast clubs, often providing meals to children from low income families, are supported or run by nearly 17 per cent of churches. 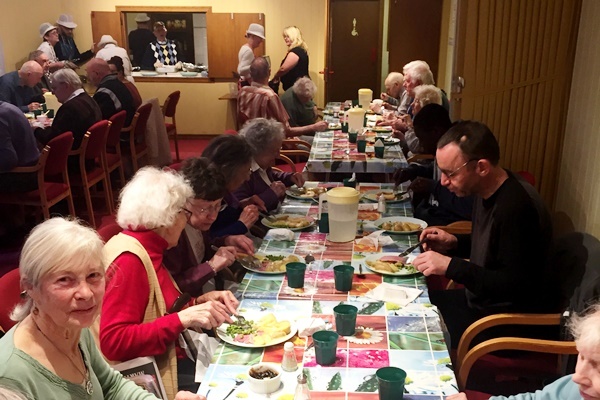 Other community action projects supported or run by the Church of England's churches involved a range of activities from bereavement support and community gardens to music events and English language tuition. Have you heard of BrightMap? How will you be supporting the Archdeacon's Charge? Could your church host a Brexit tea and prayer drop-in? Would you like to help Norwich Cathedral have some serious fun? Could you be a part of Ability Sunday? The Diocese of Norwich is the Church of England across the areas of Norfolk and Waveney — a Christian presence serving every community through a family of 650 churches and 110 schools and academies; together Committed to Growth.